The original Arturia Minilab wa a small controller with epic capability and now, thanks to user feedback, Arturia have refined the original model to deliver the Arturia Minilab MKII Keyboard Controller - a refined controller experience for everyone! The MiniLab is entirely bus powered, you don't even need to install drivers, you can even equip it to your iPad! features 25 velocity sensitive keys that can be easily adjusted with user selectable velocity curves, giving you more freedom to express yourself when playing. Alongside the keybed are the pitch and modulation touch controls for maximum expression - bend notes and modulate sounds with any assigned perameter. This works with the assignable encoders, 16 in total. These allow you to save those setups you've perfected, ready for when you next hit the road. Lastly is the two banks of 8 backlit performance pads, (16 in total!) that can be easily assigned as pads, MIDI CC buttons or program change switches. While the Analog Lab Lite software comes equipped with over 5000 synthesizer sounds, it offers much more than that. Analog Lab Lite gives you the ability to do quick and simple editing and customization of your presets, you can then save this preset and store it into the library, you can even twist and manipulate your sounds further than ever before with 17 unique, high-quality effects. Analog Lab Lite is sure to take your sound and perspective to a whole new level. Also included is a licence for the Ableton Live Lite digital audio workstation and the Grand Piano Model D virtual instrument. 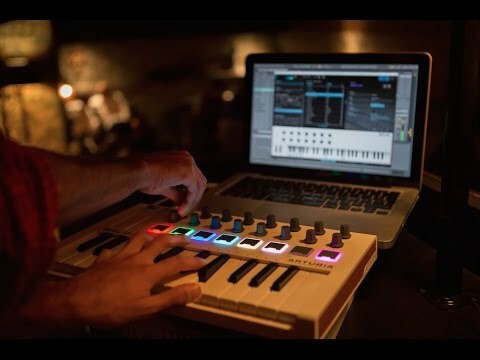 This superb package gives you everything you need to begin making incredible music with your PC or Mac, see what the Arturia Minilab MKII Keyboard Controller can do for you.